Pass your bar exam in 33% less time and with 50% less stress than the rest. My Law School Stats: Graduated in the bottom half of my class; failed the MPRE twice; Horrible legal writing grades; I had a 1/3 statistical chance of passing based on my class rank; 60% of the bar takers failed the same exam I took and, yet I still passed the California bar exam. I'm going to show you how to become a Bar Exam Passer too. 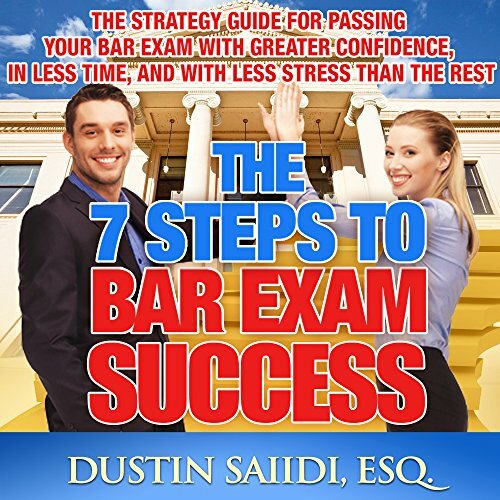 This Bar Exam audio guide book is designed for bar takers who want to be more effective and efficient in their bar exam preparation. There are only a few key concepts you need to know and put into practice that most other bar students will never know about. I'll show you how to implement the same strategies that helped me, my bar clients, and dozens of thousands of my blog readers and podcast listeners with step-by-step guidance and directions. You'll learn how to: Spend less time on your bar prep by being focused only on what really matters. The biggest myth of the bar exam preparation is that you have to spend most of your time studying and memorizing rules. I tried this for a couple weeks, until I learned it did nothing to help me pass the essays or bar exam multiple choice. The secret is to do as many bar exam questions and essays as you can, in specific manner which I will lay out for you. Decrease your stress and anxiety through the Scientific Principles of Neuroscience and Mental Performance Theory. I'll show you how the top performers and professionals use their mind and body to maximize their mindset, focus, and energy. When you use these strategies, you learn how to control your emotions, rather than have them control you.